NEW YORK (AP) — After a year of tough negotiations, Germany has agreed to pay pensions to about 16,000 additional Holocaust victims worldwide — mostly survivors who were once starving children in Nazi ghettos, or were forced to live in hiding for fear of death. The agreement announced Monday between the New York-based Claims Conference and the German government is "not about money — it's about Germany's acknowledgment of these people's suffering," said Greg Schneider, the conference's executive vice president. "They're finally getting recognition of the horrors they endured as children," he told The Associated Press. Of the new beneficiaries, 5,000 live in the United States. However, part of the agreement does not immediately cover survivors who were young Jewish children born in 1938 or later. "We will continue to press for greater liberalizations to ensure that no Holocaust survivor is deprived of the recognition that each deserves," Stuart Eizenstat, special negotiator for the conference, said in a statement. "That's why we continue to negotiate," said Schneider, who plans another trip to Berlin in January. Germany will now pay reparation pensions to a total of 66,000 people who survived Nazi death camps and ghettos, or had to hide or live under false identity. Schneider said the humanitarian deal was reached because of a broadening of the criteria for payment to Holocaust survivors. Under the new rules, which go into effect Jan. 1, any Jew who spent at least 12 months in a ghetto, in hiding or living under a false identity, is eligible for a monthly pension of 300 euros (about $375) a month. For countries in the former Soviet bloc, that amount is 260 euros. Until now, the minimum time requirement for living under such duress was 18 months. 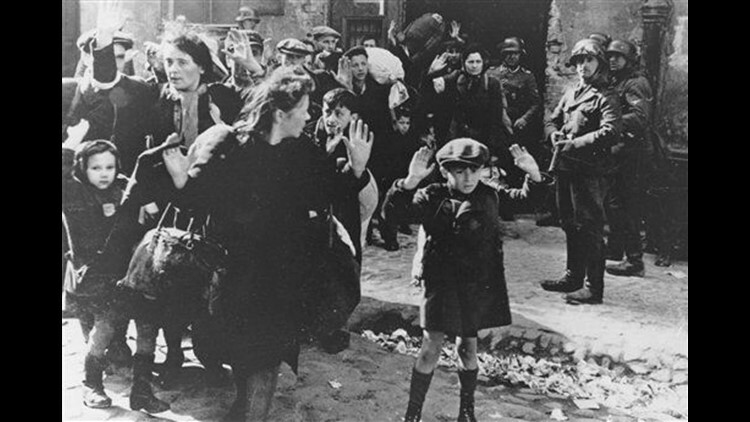 Julius Berman, chairman of the Claims Conference, which provides services and reparations to victims of the Holocaust around the world, said in a statement that conference officials "have long emphasized to the German government that they cannot quantify the suffering of a Holocaust survivor who lived in the hell of a ghetto." Living in hiding came with equally "unimaginable fear," he said — the existence of "a Jew in Nazi Europe who survived for any period of time in hiding or by living under a false identity, when discovery would have been a death sentence." The Germans established more than 1,000 ghettos for Jews while the Nazi leadership in Berlin deliberated the "Final Solution" — a plan to murder all European Jews. Some ghettos existed for only a few days, others for months or years, before residents were either shot in mass graves or deported to death camps. More than 400,000 lived in Poland's Warsaw ghetto, and hundreds of thousands of others were squeezed into similar enclaves in Eastern European cities like Vilnius, Lodz, Minsk and Odessa — starved and often battling deadly illnesses while forced to work. Germany also has agreed to offer pensions to those who are 75 or older and spent three months in ghettos like the one operated in Budapest, Hungary, from November 1944 to January 1945. That provision is expected to affect about 4,500 survivors next year and 3,500 more once they turn 75. For Budapest ghetto survivors, the payments will amount to 240 euros (about $275) and 200 euros for those in Eastern Europe — to compensate for experiences that included sights like looted corpses of Jews strewn in an area that contained nearly 70,000 men, women and children. Initially, the Jews of Budapest were protected by Swedish diplomat Raoul Wallenberg and other diplomats, who set up safe houses and issued passes. Otto Herman, 81, and his sister Erzsebet Benedek, 78, were forced into the Budapest ghetto starting in October 1944, when he was 14 and she was 11. They were freed when the Russian army arrived in January 1945, but they lost most of their family during the war. The siblings, who now live in neighboring apartments in Brooklyn's Williamsburg area, said the pensions would help them financially. But though "it will help a lot," Herman said, the money cannot compensate for the harrowing wartime experiences. "It is not enough," Herman told the AP by telephone, speaking in a thick accent. "I will never forget ... Sometimes I don't want to speak because of the memory." To reach the new accord, Schneider traveled to Berlin each month. "It was not easy to negotiate this — it took a year of hard-fought negotiations with the Germans, with many meetings and lots of documentation." Calls to the press office of Germany's Ministry of Finance in Berlin, which provides the funding, went unanswered Monday. There was no immediate response to an email from the AP requesting comment on the agreement. In all, the Claims Conference — formally called the Conference on Jewish Material Claims against Germany — estimates that the changes will result in an additional $650 million in payments to survivors. There is no deadline to apply for the pensions. Forms may be obtained through the conference website; help is also available by phone. In another new development announced this week, anyone who worked in the German-run ghettos during World War II may now receive a one-time payment of 2,000 euros (about $2,600) from the German government. Associated Press writers Randy Herschaft and Cristian Salazar contributed to this report.